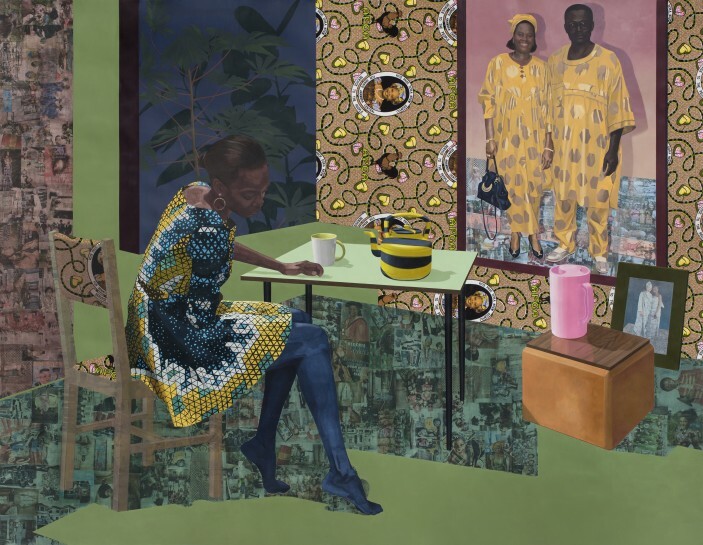 Njideka Akunyili Crosby’s solo exhibition at Baltimore Museum of Art (25 October 2017 – 11 March 2018) features new works by the Los Angeles-based artist. A focus on interiors and concomitant thoughts of being ‘at home’ – with doors, windows and screens functioning as physical, conceptual and emotional points of arrival and departure – remains foregrounded in these new works. For the artist, who relocated from Nigeria to the United States at the age of 16, universally familiar domestic experiences and social gatherings – such as eating, drinking or watching TV – are a means of examining what it means to “exist simultaneously in multiple places at the same time”. Each comprising two parts, the new works will pair Nigerian and American interior scenes to explore shifting attitudes and the transference of thoughts and ideas between one place and another. While the domestic objects and scenarios Akunyili Crosby portrays always carry personal resonance, part of their function is to reveal additional layers of meaning, for example subtleties of representation, or how ‘whiteness’ and ‘blackness’ are variously conveyed and consumed – through artefacts relating to religion or pop culture.